Unfortunately, if you use the default MVC 3 templates in Visual Studio 2010, things like the script reference for jQuery are added in at the top of the page, in the <head> section of the document. This works fine, but may potentially delay the loading of the page while the external script is downloaded and loaded. You could, of course, manually move the script references each time you create a new project, but this would result in unnecessary duplication of effort. Since I have the MVC 3 Tools Update installed, I’m also going to take advantage of the built-in support for HTML5 in the project template, to use the new semantic HTML elements in my custom template. 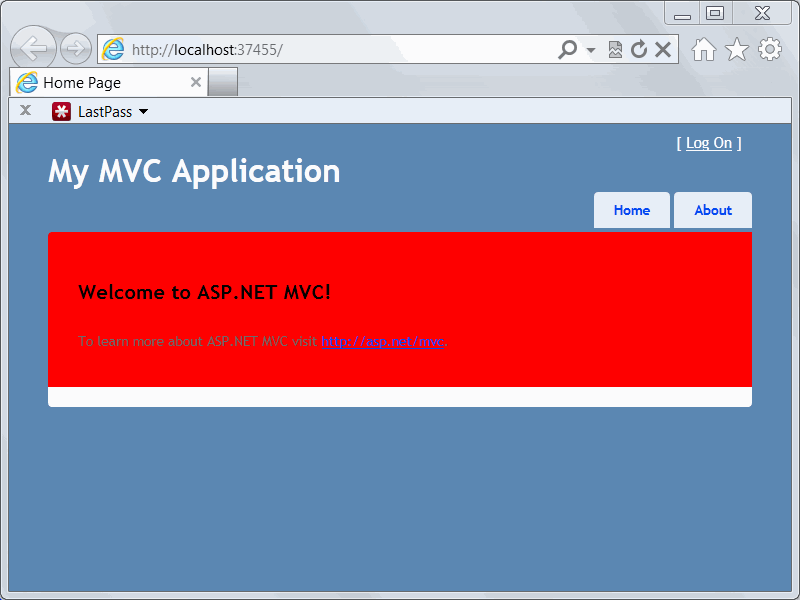 Our first step will be to create a project from our desired starting template, so starting from the screen above, select the ASP.NET MVC 3 Web Application template, and name the project “MVC3ScriptsAtBottom” (the name isn’t really important, but this will help us remember what the project was for later on). Both the <meta> element and the modernizr script reference need to remain in the <head> section, but we can move the jQuery script reference lower in the page (keeping in mind that any scripts using jQuery must be loaded after jQuery itself has been loaded). Click Finish to save the template. 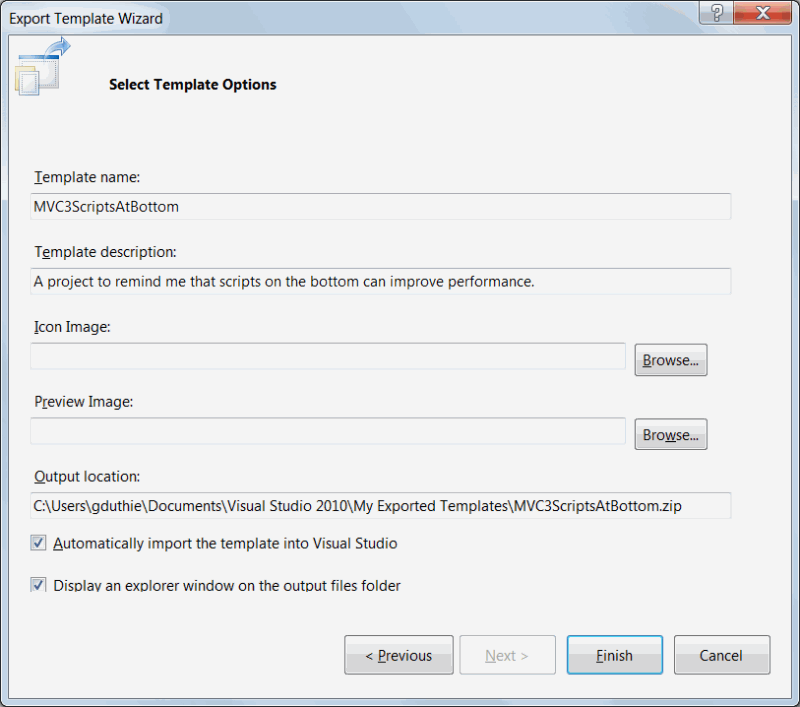 Open a new instance of Visual Studio 2010, and select File | New | Project… To make it easy to find our new template, just type “Bottom” in the search box in the upper right corner of the New Project dialog. Select the MVC3ScriptsAtBottom template, give the project a name of your liking, and click OK.
Open up Views\Shared\_Layout.cshtml and verify that our scripts are at the bottom where we want them. One big limitation of this technique is that it’s static in nature. Once I’ve created my project, tweaked it, and exported it as a template, I no longer get the New MVC 3 Project dialog, so I can’t choose to not include the HTML5 semantic elements, or create a Unit Test project at the same time as I create my MVC project. 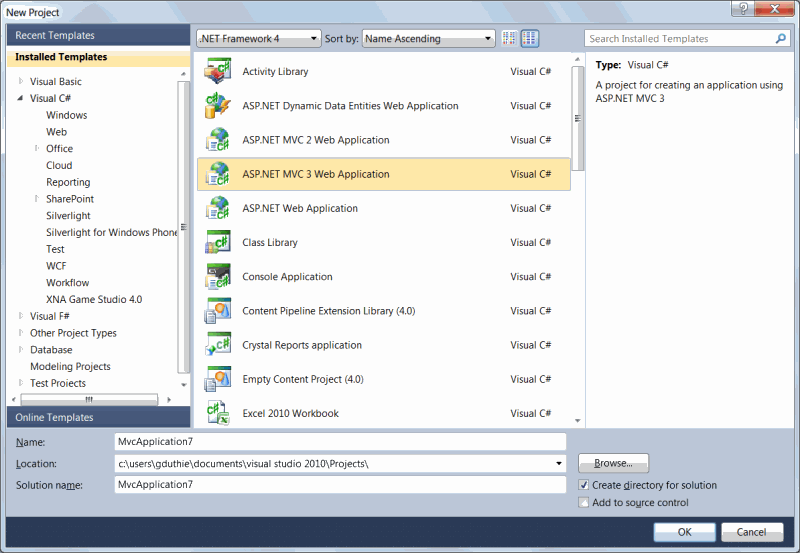 For more on some of the many options you have with Visual Studio templates, see the topic “Customizing Project and Item Templates” on MSDN. Another limitation of the exported template is that it does not address the item templates used to create new views, some of which (typically create and edit) will add script references for purposes of validation. In the next part of this series, I’ll show you how you can customize these templates to move their scripts to the bottom of the page. One last limitation is that having a <script> block at the end of our Layout page is of limited utility, since more often than not, we’d want to have the scripts in our View, not our Layout page. In part 2 of this series, I’ll show you how we can use some Razor magic to address this limitation as well. For folks who prefer their tutorials in video format, there’s a DevNugget screencast of this topic available. You can find it on the DevNuggets show site on Channel 9. Special thanks to Chris Love, who sparked the idea for this post with an email to a list I’m on regarding this very topic. Thank you for this article, learned a new thing today!